Say Woof Petography: Daily Photo - Edgrrrr - Yep! That's My Name! 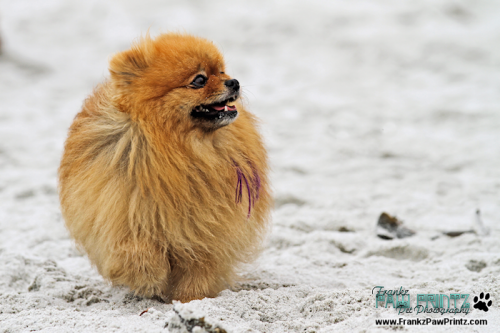 This little guy was the cutest little Pomeranian. I was able to photograph him at the Carmel by the Sea Event Poodle Day. This was taken during Poodle Play on the Beach. I loved the Purple hair extentions that he flaunted. Has your human ever put hair extensions in your coat? Please leave us a comment! LIKE Us on FaceBook and let us know about your hair-dos! Zazzle products with Edgrrrr can be found by clicking the photo above!